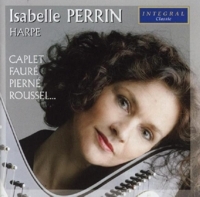 All six composers presented on this CD of French harp music were born during the final five decades of the 19th century, the earliest (and best known), Fauré (1845), followed by Pierné (1863), Roussel (1869), Caplet (1878), Tournier (1879) and finally Grandjany (1891). all of it, with one exception, had its first performance in Paris, and on an Erard harp. It was a golden age - peace prevailed between the major powers of Europe-and Paris was known as the Ville Lumiere (City of Light).In 1844 the Place de la Concorde had been illuminated by electric arc light, with the first electric arc street lighting following i 1878; the Concerts Colonne were founded in 1873 and the Palais Garnier (Paris Opera) opened in 1875: there were the Universal Exhibitions of 1867, 1878 and 1889, and the 300 metres high Eiffel Tower, built to celebrate this event, was the world's tallest building, remaining so until 1930. New technologies saw the development of the automobile, the telephone, cinematography and the first subway system. The Arts underwent a radical transformation and Music became an increasingly important part of the culture of what became known as La Belle Époque (The Beautiful Epoch). Music was an integral part of city life,and Paris was alive with music. All the romance of the Ville Lumière is distilled in this delightful CD. The youngest of the six composers presented here, Marcel Grandjany, was born in Paris in 1891, and the piece by which he is represented in this collection is the last to have been composed. Although he gained his Premier Prix in the Paris Conservatoire class of Alphonse Hasselmans in 1905, he was a private student of Henriette Renié. Obliged to set aside a promising career at the onset of the First World War, Grandjany resumed it afterwards, making his London debut in 1922 and his New York debut in 1924. He settled in New York in 1936, taught at the Juilliard School, and became an American citizen in 1945. From about this time, his music begins to become more Americanised and his earlier rhapsodic virtuoso style is replaced by American folk music influences-pieces like Colorado Trail, Erie Canal and Deep River Interlude(for three harps) come to mind-and simpler style of composition, an innocuous innocence and an unsophisticated American dream. The Children's Hour Suite (op.25) was written in 1947, and each piece in this little set of interlinked pieces, is dedicated to a different former American pupil. Gabriel Pierné, composer of the delightful Impromptu-Caprice which follows, was not only a composer, but also a conductor of the greatest distinction, responsible for first performances(amongst many others) of Debussy's Iberia, Images and Jeux, Ravel's Tzigane and Daphnis & Chloé and Stravinsk's Firebird (which he conducted for Diaghilev's Ballets Russes). Born in Metz, raised in Paris and trained in composition by Massenet, Pierné had won the Prix de Rome in 1882 at the age of 19. After the requisite three years at the Villa Medici in Rome, the 22-year old returned to the Paris of La Belle Époque and attempted to make himself known on the fashionable soirée de salon circuit. It was for these salon concerts that he composed his first version of the Impromptu-Caprice (op.9). In 1900 it was embellished with passages of a more virtuosic nature for the use of the annual Conservatoire Concourse(end of year examinations), subsequently becoming so popular with harpists and audiences alike that it vied for popularity with La Source by Albert Zabel. Pierné's later style owed something to Debussy's harmonies, Ravel's luxuriant orchestration and Roussel's dynamism. In contrast, this early piece has the delicacy and charm of a painting by Fragonard. It is interesting to note that Pierné died in 1937- the same year as both Roussel and Ravel. Like Pierné, André Caplet was a conductor of major importance. The seventh child of impoverished parents, he was born in Le Havre in 1878, but by his early teens he was already living in Paris and working as a professional musician, able to subsidize his studies by working as an orchestral player, arranger, composer and conductor. He won the prestigious Prix de Rome for composition in 1901, and from 1910 to 1914 he was in the USA as conductor of the Boston Opera Orchestra. Returning to France to undertake war service, he was badly gassed, and as a result was obliged to give up all his activities except for composition. The scintillating Divertissement à la francaise and the highly innovative Divertissement à l'espagnole were both composed in 1918, and inspired by the brilliant playing of Micheline Kahn. In the Divertissement à l'espagnole an element of exoticism is implied by the unusual direction that the piece should be played avec galbe et très drapé, a possible interpretation being voluptuous and sinuously flowing. Whilst it cannot be stated that Caplet was the first to use the pedal glissando, he was the first to exploit it to such an extent and to such brilliant effect. A superbly virtuosic piece, and in complete contrast to the clarity and poise required in the Divertissement à la francaise, the Divertissement à l'espagnole evokes the atmosphere of a sultry Spanish night under a starlit sky. It requires the same combination of absolute control and complete abandon that is essential to the successful performance of genuine Andalusian flamenco. Gabriel Fauré's Une châtelaine en sa tour... (op.110) was composed in Paris in the tumultuous last war-torn months of 1917-18, and it is extraordinarily difficult to imagine how such a restrained, poetic, calm and lyrical piece could have been written in such dire circumstances. The poem by Paul Verlaine of which Une châtelaine en sa tour... (a princess in her tower) is the second line, had been set by Fauré many years before in his song -cycle La Bonne Chanson of 1892-94. The atmosphere beautifully suggested by Fauré's hauntingly lovely solo piece is evoked by the unusual name Verlaine's fiancée, Mathilde Meuté De Fleurville (son nom carlovingien - her Carolinian name). Une châtelaine en sa tour is the second of Fauré's two works for solo harp and is dedicated to Micheline Kahn, who gave its first performance a week before the Armistice on 3rd November 1918. By this time, Fauré had long ago admitted to his increasing deafness, which meant that he could only hear within a limited musical range, and it is interesting to note the limited range of this piece, which is mostly confined to the central part of the harp. Fauré had been appointed to teach composition at the Paris Conservatoire from October 1896. The students who grduated from his class included Ravel, Florent Schmidt, Koechlin, Enesco and Nadia Boulanger. He was appointed Director of the Conservatoire in 1905, but it was for the previous year's Concours that he had composed his Impromptu (op. 86)- probably the best-known solo in the whole harp repertoire. In the Impromptu two ideas are developed alternately. In the first section the Allegro moderato molto with it imposing Db major chords is followed by a dreamy Meno Mosso, whilst the second section brings the two ideas together in virtuoso fashion, with sweeping glissando cadences and effectively used harmonics. Born in land-locked Tourcoing, Albert Roussel was an orphan, losing father, mother, paternal grandparents and maternal grandfather, all before he was ten years. Sent to Paris by his guardians at the age of 15, he entered the Naval Academy (École navale) in 1887, passing out as a midshipman two years later. It was during a voyage to India that he began serious composition and became fascinated by the music of that country. Aged 25, he resigned from the navy and began the serious study of music and then he taught at the Schola Cantorum in Paris from 1902 to 1914. Taking leave of absence, he and his wife embarked on a long voyage to India and Cambodia, one result of which was his opera-ballet Padmavati (1913-1918). Fascinated by the music and legends of India and deeply inspired by oriental music techniques, he developed a unique and unfamiliar personal language, partly based on Indian modality. In the Impromptu (op. 21), written the following year and first performed by its dedicatee, Lily Laskine, on 6th April 1919, these exotic quasi-Indian oriental modes are heard again. The raga used here is based on the tuning F, G, Ab, B, C, Db, E.
There can be no doubt that of all the composers represented here, Marcel Tournier was the most influential in the French harp world of the first half of the 20th century, having been Professor of Harp at the Paris Conservatoire from the death of Alphonse Hasselmans in 1912, until his own retirement in 1948. A list of his Conservatoire students reads like a virtual roll-call of the important French harpists of the 20th century (and includes Elizabeth Fontan-Binoch who taught Isabelle Perrin). He composed prolifically for the harp, seeking to extend its colouristic potential, investigating numerous effects and increasing the tonal possibilities of the instrument. Much influenced by Debussy, Ravel and Impressionistic-are full of imagination, charm and poetry. The first Sonatine, composed in 1924, has become a true classic of the French repertoire. Technical mastery and musical insight are well in evidence, but there is also much that reflects the period during which it was written, the influence of the music of Ravel being particularly apparent. It is Tournier's elegant music which brings this delightful recital to a close.